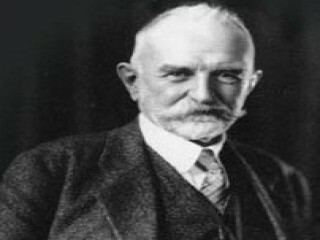 The American philosopher and social psychologist George Herbert Mead offered a naturalistic account of the origin of the self and explained language, conception, perception, and thinking in terms of social behavior. George Herbert Mead was born on Feb. 27, 1863, in South Hadley, Mass. He graduated from Oberlin College in 1883 and attended Harvard University in 1887 and 1888. While studying in Leipzig and Berlin (1888-1891), he was influenced by the physiological psychologist Wilhelm Wundt. Mead taught at the University of Michigan (1891-1893) and the University of Chicago (1894-1931). He died in Chicago on April 26, 1931. The notion of "gesture," which Mead took from Wundt, is basic to Mead's behavioristic psychology and to all of his philosophic thinking. If the behavior of one animal evokes a response in another that is useful in completing a more inclusive act, it is called a gesture, and the behavior of the participants of the act is social. In Mind, Self and Society, Mead shows that human beings are distinguished from all other animals in that an individual can by his gestures (words, that is, language gestures) evoke in himself the same response that he evokes in another and can respond to his own behavior (words) as do other members of the community. This means that the human individual can look at his own behavior from the point of view of the other; or he can take the role of the other and, thus, be an object to himself. When the child can view its own behavior from the perspective of another, it is a self, or it has a self. Selves emerge in children out of social behavior with other members of the group who, with the child, are participants in social action. The meaning of a gesture is the response it evokes; a language gesture has the same meaning to the speaker as it does to the one to whom it is addressed. When a gesture (or significant symbol) has common meaning, it is universal in that the response it evokes is the same for each member of the community. One perceives an object, such as a tree, only in relation to behavior or to responses evoked by what is seen, heard, or smelled. The lumberman "sees" the tree in terms of lumber, and his responses are organized accordingly. It is only because of symbols having common meaning that men can think or reason. Thinking is a conversation of the self, the individual, with the other, or with what Mead calls the generalized other. Individuals have minds, therefore, because they can take the attitude of others (take the role of, or enter into the perspective of, others) and can thus anticipate the response that others will make to their gestures. The individual member of society, through thinking, can propose new ways of acting which are shareable and testable by other members of the community. The physiological basis for thinking and for basic distinctions between man and lower animals is the hand. Not only can men move physical objects from place to place, but they can also dissect objects and reassemble them in various ways. Thinking has to do with the manipulatory phase of social action. In Mead's last work, The Philosophy of the Present, he shows that the same basic principle used in creative, or reflective, thinking, resulting in acts of adjustment between the individual and its environment, applies also to every kind of adjustment in the process of evolution. The adjustments that new planets make to the system from which they emerged (and vice versa), as well as adjustments made by lower animals to their respective environments (and the environments to them), take place in accordance with the same principle applied in reflective thinking. This is the principle of sociality, and it requires that the newly arisen entity, the emergent, be in two or more different systems at once, even as reflective thinking requires that the individual be in both his own perspective and in the perspective of the other. Through the principle of sociality Mead not only accounts for the process of adjustment, and thus strengthens his position as a process philosopher, but he also develops a system of philosophy based on the act of adjustment as a unit of existence. His system explains how emergence, novelty, creativity, thinking, communication, and continuous adjustment are interrelated and why each is a phase of the natural process of adjustment. View the full website biography of George Herbert Mead.